AQ Audio SmartSpeaker A1 review | What Hi-Fi? The AQ Audio SmartSpeakers may look like a standard, albeit distinctive, pair of desktop speakers, but they offer more than you might at first think. For starters, each of the identical A1 speakers is just as happy working on its own as it is as part of a stereo pair. Opt for just one unit and you get a speaker that offers a 3.5mm input, plus wireless connectivity via Apple AirPlay or WiFi Direct. So you can stream music wirelessly over your internet network from iTunes or Windows Media Player on a laptop, from iOS devices, from Android devices and from compatible Windows Phone devices. You can also put two A1s together to form a stereo pair. A switch on the back of each unit allows you to set it as a left, right or mono speaker. Add more for a multiroom system, all playing the same track (only from iTunes, however). To use two as a stereo pair you need to stream from iTunes on a laptop – you can’t select the ‘Multiple Speakers’ option from a smartphone or tablet. The speakers also have integrated rechargeable batteries, good for around 10 hours of wireless playback. So far, so good. The first signs of trouble appear in the set-up procedure. The simplest way to get up and running wirelessly is by connecting an iOS device via USB to the speaker. Hold down buttons on the A1 and your phone or tablet will send over your internet settings. Hey presto, you’re connected. Otherwise, you’ll have to set up the speakers using a computer. This proved more complex – we needed multiple attempts to get it working. The wireless connection from a laptop to the speakers in stereo mode proved none too robust. We experienced sporadic interference and drop-outs – admittedly in a busy wi-fi environment. Sound quality proves underwhelming once we get up and running, too. There are so many features that we half expected audio performance to lag behind that of rivals – and so it proved: the SmartSpeakers sound lightweight in comparison with others. Disclosure’s Latch lacks dynamic punch and bass weight, bass notes struggling in terms of depth and power. Vocals, too, lack clarity and the overall level of detail is a step below rivals here. The A1s do avoid harshness in the treble and offer a fairly open sound. There’s decent scale for a small speaker, but really they’re a step below the best. Connect via the 3.5mm input and you will enjoy a sound that’s clearer, a little more solid and a little more detailed. The A1s are undoubtedly smart. The speakers make most sense used individually – two wireless speakers for this money represents better value. 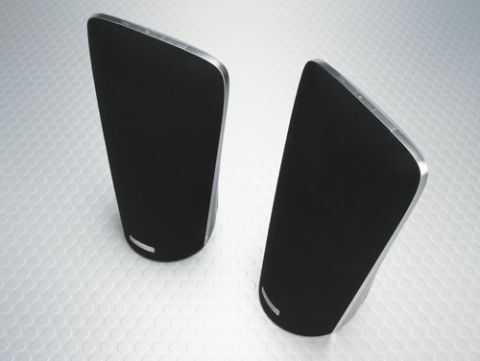 Bought as a pair, they’re highly versatile, thanks to the wireless connectivity and pairing option – even if set-up and the limits of the features are frustrating. If flexibility at a relatively affordable price means more to you than sound quality, the SmarSpeaker is worthy of consideration. But, for most, we’d suggest better sonic options should take precedence.